CPI is released tomorrow, and everyone’s wondering if we’ll finally get that seriously hot inflationary report that will force the Fed to take tightening more seriously. There’s a lot of talk about the MIT Inflation Index — an alternative measure of inflation that uses internet prices — that recently ramped up hard. We mentioned it yesterday. In a note, Bank of America’s Ethan S. harris and Michael S. Hanson take the index head on and deny that it has any relevance to the CPI. They deny that there’s any reason to think that the spike in the MIT Index is indicative of anything in the CPI. The new hot inflation indicator making the rounds on Wall Street is the MIT Inflation Index. The US version of the index is based on 53 on-line retailers and 550,000 products. By using Internet prices, two MIT professors are able to create a daily price index. The data have only been compiled since March 2008, but so far they seem to track the overall CPI remarkably well. Both fell about 31⁄2 or 4 per cent through March 2009 and both have risen steadily since. On a troubling note, the MIT index has been growing faster than the official CPI in recent months. From mid-January to mid-February, the index is up a huge 0.7 pp. Should we be worried? There are a number of reasons to doubt these data. First, and most important, its recent correlation with the CPI appears accidental. Both series went down then up during this period, but for different reasons. The main reason the CPI fell into the spring of 2009, and has risen ever since, is the up and down swing in energy prices. Stripping out energy, consumer prices have been rising at a gradually diminishing rate. 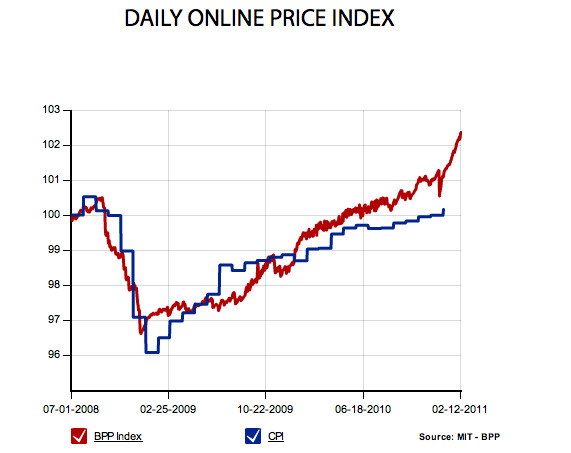 The MIT index does not include energy: something else is driving the online price index down then up. Another problem with the index is that it is not seasonally adjusted. This is the second year that online pricing has softened during the holiday shopping season and surged after the season. Apparently, on-line retailing gets very competitive during the shopping season. Some of the post-holiday bounce may be because Internet sales have been very strong in recent holiday seasons, leaving low inventories and higher prices after the holiday season.